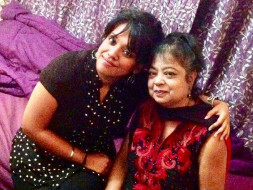 On 4th of July 2017, my mother, Mrs Anima Sharma, was rushed to the Emergency Ward at Fortis Hospital, (Bannerghatta Rd, Bangalore India), after continuous episodes of vomiting, retching and breathlessness. The doctors quickly concluded that she requires immediate care and suggested we transfer her to the ICU right away. 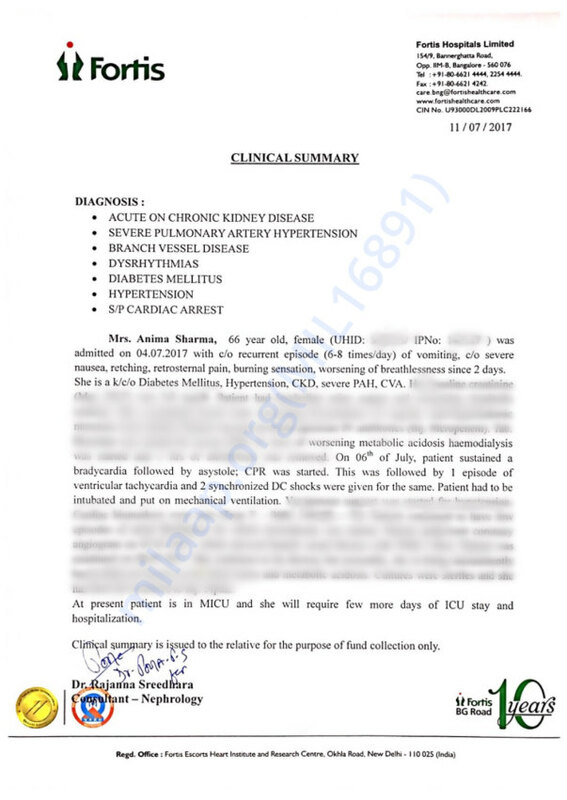 She is a diabetic (Type II) and has Pulmonary Hypertension and Chronic Kidney Disease, and her condition quickly escalated during her stay at the ICU, developing new symptoms; and she's now diagnosed with a few more, as mentioned in the attached document, including cardiac arrest. She also had to be on assisted breathing and they had started her on dialysis, and looking at her current condition, she may have to continue dialysis lifelong going forward. It's been over a week at the ICU and she's still undergoing treatment. They have advised her atleast a few more days of ICU and hospitalization, but also suggested it could take longer, as it is difficult to predict how soon she'll recover, given her current condition. The bills are piling up by the minute and with the help of a few friends, I managed to cover some part of it, but have now run short of funds and need your help ASAP. I lost my dad at the age of 16 and I am now the sole breadwinner of the family. I have lost my home too and have been living on rent. I'm currently working as a freelancer, which doesn't allow me medical or financial benefits. Loans and insurance are also no longer an option at the moment. I have reached dead end and I can only continue her treatment with your help. Every little bit helps and your contributions, no matter how big or small, could mean giving a ray of hope and saving a life. Please have my mom in your prayers and I thank you in advance for your generosity. God Bless. Note: The Clinical Summary, duly signed by the MICU staff is attached as proof. The blurred content only has detailed info of her reports and medications/treatments provided which can be shared with those who wish to contribute towards her treatment. Thank you so much for your contributions and prayers. It breaks my heart to say that she has passed on, on this date, last month (4th Aug '17). She fought the last 7 hours of her life very courageously and literally came back to life twice in one month, surprising everybody, but had to let go the 3rd time. She was called a miracle and she had the strength to come so far because of your prayers and well wishes. I'm sorry I took so long to update you, I was caught up with informing relatives and friends and all the final rituals,etc. It's been very difficult beyond words, and I know I won't ever heal from this pain, but hopefully I'll find a way to deal with this better. And yes, I'm still struggling financially, because the final bill was extremely high and I'm still trying to make arrangements to pay off the debts. I will be closing this campaign, but if you or anyone you know would like to support further, please email me at :: julee.sarmah@gmail.com. My mom's always so grateful to those around her and one of the last things she said was "Don't forget to thank them." Thanks again. Blessings from God and my mom. Don't worry I will pray for her good health.